Figure 2-1 Cross section of regional hydrological processes. Precipitation is the source of both surface water, such as streams, and groundwater on Pacific Islands. Variations in precipitation and evapotranspiration rates therefore affect both resources. Surface water is important for human use and provides habitats for fragile ecosystems. 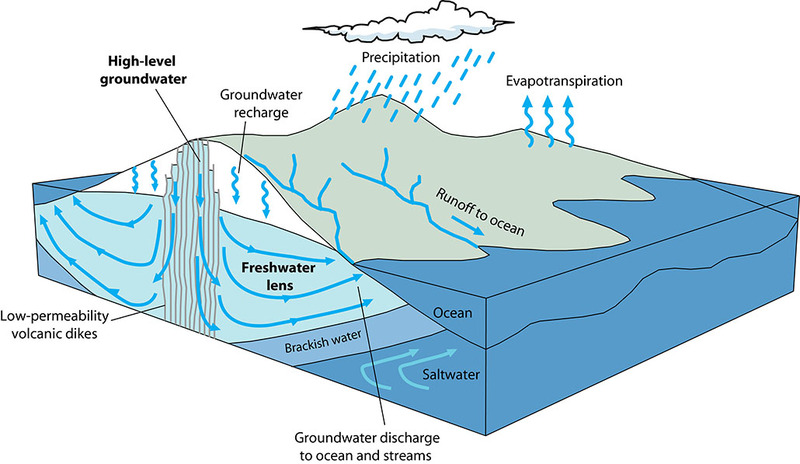 Groundwater in islands exists as a freshwater lens underlain by saltwater, and on high volcanic islands it may also exist as high-level groundwater. Groundwater is a principal source of drinking water on high islands.